...1999 Echo Mtn. Echoes Volume 4..
Quite often after seeking out or being led to the worlds greatest mountain railway, the Scenic Mount Lowe Railway, one finds themselves gathering artifacts, memorabilia and any information they can find out about the place so as to gain a greater insight into its popularity and fame. It is a great passion for collectors across the nation to scour the marketplaces and find tiny treasures to place in glass cases or to adorn a shelf. They are all reminders of the late great past of this wonderful place and in some ways we become part of the essence of Mt. Lowe. Mt Lowe, which without Thaddeus Sobieski Constantine Lowe would not have existed as we have come to know it. So, for this writer, aside from the silvery spoons and glass treasures that I seek out, there are also the paper treasures or paper trails as I call them. The little scraps and clippings found in newspapers, journals, and histories that help to fill in areas of Thaddeus Lowes life, and help us to understand and know him and the railway better. 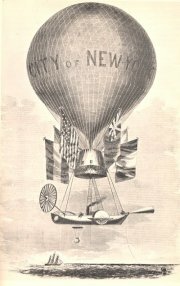 Thaddeus Lowe's fabulous airship "The City of New York" with flags flying and the 30' Francis Lifeboat underneath christened "Leontine." Image from Harpers Magazine courtesy Michael Patris Collection. Ninety days to spend on a project doesn't seem like very long at all, but when one is building the largest hot air balloon known to man the time hardly seems sufficient. 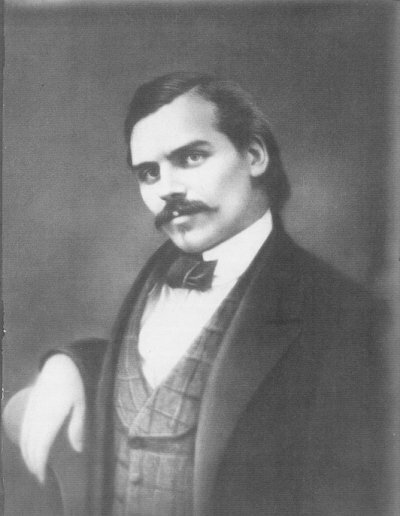 Yet al the experience Thaddeus Lowe had gathered in his 27 years put this young man at the forefront of American ballooning. The goal was to cross the Atlantic Ocean and Lowe wasn't the only one trying to do it. Old enough to be his father, John Wise had some following for being a pioneer balloonist and with his ship, the "Atlantic", to many it seemed all too possible. Since the mid 1930's, Wise had accomplished nearly 250 ascensions, and with his latest balloon being tested, Thaddeus Lowe appeared to be only a minor annoyance to the seasoned flyer. With fellow balloonist John LaMountain and millionaire O.A. Gager as co-backers of the project, the trip across the ocean seemed just a flight away. Not only had these gentlemen backed the "Atlantic", together they had broken a record for the day by flying from St. Louis, Missouri to Jefferson County, New York...a trip of about 800 miles in only 19 hours. It's fall, and the weather is cooler. You can relax just a bit now that the oppressive heat of summer is over, but you know that winter is coming soon. For most of the Angeles National Forest, that means that soon there will be snow. Seasons. Changes. The mountains are a dynamic interplay of all the forces of nature. And the more you enter the forest, the more you explore the trails, the more you consider what it takes to sustain life anywhere, you cannot but be amazed and fascinated that Native Americans once resided throughout the forest. Visit Mountain Marketplace - updated with every new issue. First of all I would like to thank all of you for your patience regarding the tardiness of the fall issue of the Echoes, you can be assured that as soon as I was able it was tackled with the fervor of past issues. It is my intention to bring to you in this issue the beginnings of TSC Lowes life as best I can with the limited resources available and wading through as much of the misinformation as possible to bring you the most accurate report I can gather. I did managed to find 11 different sources however critical records of the County of Coos in New Hampshire were destroyed by fire. With the help of resources and descendants the Land-Sea Discovery Group will continue to expand upon knowledge of the life of Professor Thaddeus Lowe and the Scenic Mt. Lowe Railway. Send email to Echowebmaster@aaaim.com to report any problems.